Learn about sickle cell disease and trait, why it affects the Black community more than others, and speak with leading experts in the field! Cascade Civic Alliance and BLKHLTH are hosting a film screening of Soul Food Junkies. 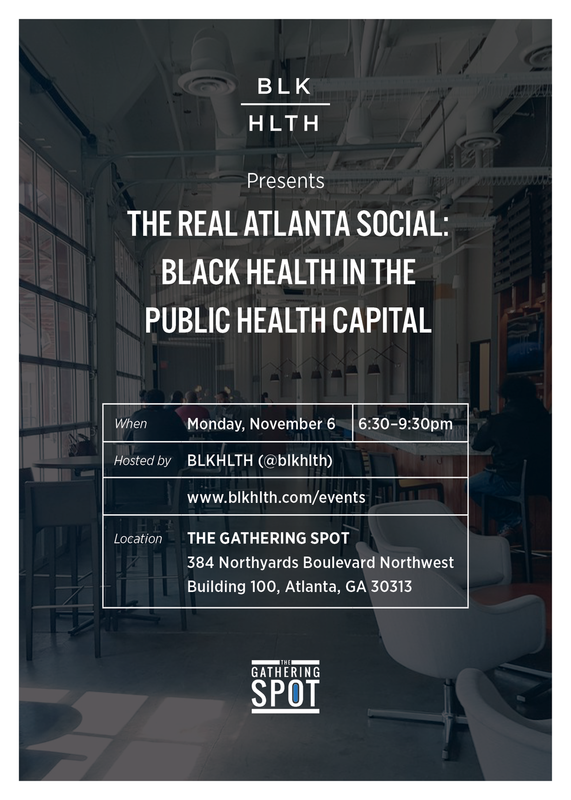 During the week of the American Public Health Association (APHA) Annual Meeting and Expo, hosted in Atlanta, GA, BLKHLTH is hosting The REAL Atlanta Social: Black Health in the Public Health Capital. Join us at The Gathering Spot, Monday, November 6th from 6:30pm - 9:30pm to eat, drink, make new connections, and discuss and strategize solutions to some of Atlanta's top public health issues that impact the Black community. We will also have pictures on display from our very own Health Disparities in Atlanta photo series project, presented this year at The Atlanta Studies Symposium. We hope you can join us for an educational and entertaining evening! Come join BLKHLTH for our Launch + Social at MBAR!